This weekend was the annual Penny Arcade Expo, perhaps the world's biggest gaming convention now that E3 has been subdued. Thousands of gamers gathered a few blocks from where I live here in Bellevue, Washington, to look at what gaming looks like in 2006 and looking beyond to 2007. The conference was a geek fest if I've ever seen them, but there was one glaring constant throughout: the Nintendo DS. Almost everyone and their mother had a DS in hand, either laying on the various cushions in the halls, waiting in line or sitting at the tables. Notably absent was the PSP. Nintendo Wii + Xbox 360 = Playstation 3 ? E3 has been great for 2 out of 3 parties, and horrible for one. Nintendo has had great success. This video displays the insane line around the Nintendo booth to play their new console, the aptly titled Wii. This console is set to revolutionize the gaming world by allowing players to move the controller instead of moving joysticks to play the games. Sounds like fun right ? Microsoft released a short clip of Halo 3, as well as slew of new games that look fun. They also announced that Grand Theft Auto 4 will be released simultaneously on the Playstation 3 and Xbox 360. They expect to have around 6 million consoles sold before the Wii and PS3 launch, giving them a very significant head start. Sony meanwhile, announced... a new controller, that looks exactly like the Playstation 2 controller, with half baked ideas stolen from Nintendo. They also announced a ridiculously high price of $600 for their higher end model with the supposedly superior Blu Ray DVD technology. And this is what they're basing the future of their company on ?! I've never been a huge fan of Sony's, especially the Playstation, I always though their products lack passion and character. It's finally clear as day now that two very passionate companies, with very bright people are staking their claim to the next generation of game consoles. This seems to me to be a repeat of what happened with the artifact known as the Sony Walkman. Sony had a huge portion of market share and failed to see the potential for MP3 music players, instead banking on a crappy and proprietary product, the Sony MD walkman. Meanwhile, Apple created the ipod, took almost all of Sony's market share, and Sony was slow to react. When's the last time you've seen a Walkman ? Maybe at a garage sale 4 years ago ? If Sony loses the console battle, what sort of products do they have left that will give them a competitive moat large enough to distinguish them from the competiton ? The answer is not many. If the Playstation 3 fails, even if it succeeds moderately, Sony risks losing a lot more than the gaming battle. That's because they bet on Blu Ray technology, which is looking an incredibly bad idea at the moment. These Blu ray enabled playstations will cost the consumer $600, while the Nintendo Wii is rumored to be coming in at the sub $250 and the Xbox 360 tops out at $400. So it doesn't take an economist to do the math. For the price of a PS3, you could purchase an Xbox 360, which will have pretty much the same graphical wizbangs of a playstation AND buy a Nintendo Wii, which will have what looks like the funnest controller ever created. I think I'll opt for option 2, thank you very much. Nintendo is about to break through with it's revolution. Recent news indicates that it's portable Gameboy DS is outselling Sony's PSP 6 or 7 to 1. Geeks are all over it's next generation console the Revolution. It seems the boys over at Nintendo learned a few things from their lackluster release of their last console, the GameCube. Revolution is an appropriate title for this new console if it delivers on its promises. Revolution's controller will respond to motion, so instead of say, moving a stick around, moving the whole controller will create movement on the screen. The pricepoint is also (supposedly) much lower than it's two rivals, the Xbox 360 and Playstation 3. Meanwhile, Sony, which dominated the last console war, seems to be lagging behind its competition. While the Xbox 360 has been out for a few months now, Sony has scrapped it's controller and pushed back it's release date a couple of times. Nintendo will always be a favorite amongst gamers for it's eternal classics. They will continue to tap into its uniqueness and perhaps more so for this release. I for one, am very excited to see what they come up with. 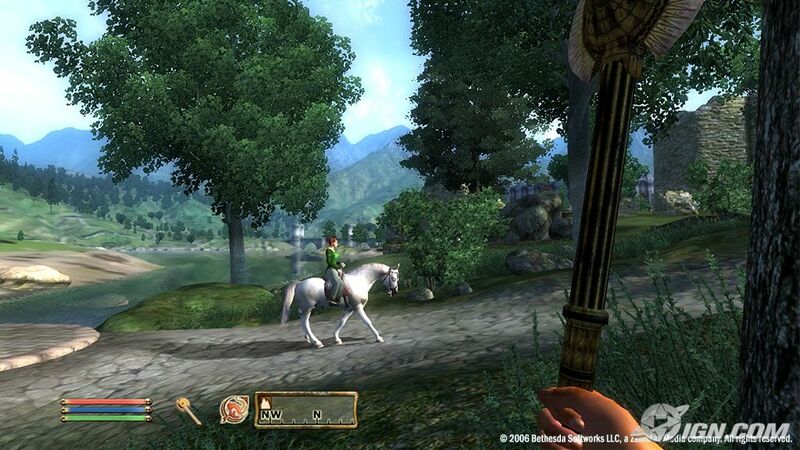 The fourth part in the Elder Scrolls series really shows what next gen gaming is all about. This is by far the best Xbox 360 title, and makes it worthy to buy one (although the game is also available on PC for those on a budget). First the graphics. Wow. I was amazed at the skills of the design team to put together something so pretty. I enjoy spending time just walking around the enviroment. Gameplay is also excellent. With both a first and third person view, and easy controls, I felt right at home very quick. Fighting is very fun and engaging, as you take on legions of rats, goblins, devil like creatures and a whole bunch of other enemies. The story line is very engaging and character interaction is very well designed. The premise of the story isn't a new concept however, a regular good vs. evil type role playing game. I have failed to become engaged in other role playing game, as the amount of time required to play through reaches past a 60 hour timeframe. This one, however, has kept me going every day, eagerly awaiting the quests that lay ahead. Yesterday, a car nearly ran into me. In the matter of a split second, I was able to quickly hit the brakes and skid right. It seemed very natural to me, as if I'd done in hundreds of times before. The truth is I have done it hundreds of times, starting with Rad Racer back in the 80's, to Grand Turismo for Playstation in the early 00's (a phrase I will be coining from now on), all the way up to Project Gotham 3 for Xbox 360 this year. It seemed clear to me that video games have made my driving far superior to what it was, and has saved me from an accident today. As time progresses, I hope to see more and more simulation training put into place, as I have seen its benefits firsthand.